Karina's Kreations: Sale-a-bration starts today! I'm so excited that the new Occasions catalog is live today. There are so many fun projects and for every $60 you spend on any Stampin'Up items, you get a FREE item from a special Sale-a-bration catalog. There are 11 items to choose from. If you spend $120.00, you get to pick from 2 extra special items. Click this link to see the Occasions and Sale-a-bration catalogs. 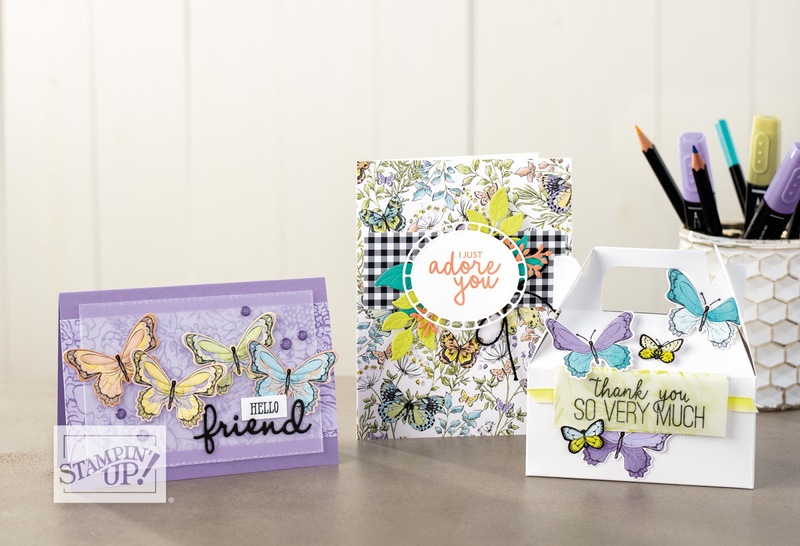 The cards are made with the Free Botanical Butterfly Designer Series Paper. This is one of the Sale-a-bration items. Here's a quick video of the paper. Here's the supply list for the card in the center. Click on a picture to go to my stamping store.